What in the nineteen hells do you think they're saying in these pictures? 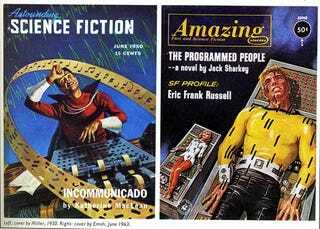 From a book about the history of science fiction come these two utterly freaktastic magazine covers. Help us out, people — what's going on here? What are these people saying? Image via Kollage Kid on Flickr.